Tenley Molzahn’s exuberant attitude toward “life as an adventure” has taken her on a journey from Newberg, a small town in Oregon, to Orange County, California, to Japan, to Hollywood, to Africa and many points in between. Along the way she has enjoyed opportunities to learn and grow, embracing opportunities to positively influence those who cross her path. Although many recognize Tenley from her television experiences with ABC’s The Bachelor and Bachelor Pad, dance was Tenley’s first love. It took her to sunny California, where she danced professionally at Disneyland, and then a 9-month role at Disneyland in Tokyo as an aerialist, impressively flying 70 feet in the air as Ariel, the Little Mermaid. Choosing to be a cast member for reality TV requires a willingness to be vulnerable. Tenley’s sincerity and positivity came through, in spite of being runner-up on both shows. She turned her popularity with her audience into a stint with E! News, The Daily 10 as a correspondent and experiencing her own "behind the scenes" experiences. She’s also had the opportunity to appear in television commercials and has modeled, primarily in the fitness industry. Life hasn’t been smooth sailing, as she suffered from painful, sometimes debilitating stomach/intestinal issues until just a few years ago when she was able to determine a gluten-intolerance and then through self-education modify her lifestyle, especially her eating plan, and significantly improve her health. 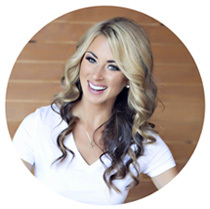 In the process, Tenley discovered a passion for wellness. She went back to school, studying nutrition, and is now a Certified Health Coach. Combining her passion for nutrition and her passion for fitness, Tenley now offers hope for improved wellness for those who have struggled like she has. She is able to consider the whole person when working out a plan for individuals that will move them from disabling symptoms to relief and peace. Throughout her transitions through a painful illness and exciting adventures, Tenley’s faith in God, is a noticeable pillar, influencing her worldview and perspective. It’s important to her to live a life that will have a positive influence in the world. She has an innate ability to relate to people of all ages through telling her own story and hearing theirs. Currently Tenley is blessed with a home near the Southern California coast, where she can be seen running, doing yoga or barre, and sometimes even surfing. Finding a balanced lifestyle for herself has been a huge part of her journey toward assisting others to establish the same for themselves. She continues to travel, and especially enjoys “service” trips and has been an Ambassador for the Kusewera organization, promoting ‘creative & active play’ for orphanage children. Tenley can also be seen at many philanthropic events as a supporter, keynote speaker, emcee, or even running on behalf of several organizations. Tenley finds great joy in lending her hand toward good causes. If it is helpful to others, Tenley is a great person to have on the team!